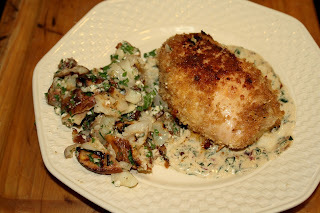 Bev wanted to make Chicken Cordon Bleu and I remembered a recipe for a grilled version I had saved. When I went looking, it turned out to be from friend Chris at "Nibble Me This" and posted on the OurKrazy Kitchen blog in July, 2010. We sided it with grilled potato salad using a recipe from Mary Constantine’s column in the Knox News Sentinel on May 22, 2013. 1. Place potatoes in a large saucepan of water and season with a few pinches of salt. Bring to a boil over high heat and cook for about 15 minutes, until the potatoes are just tender. Drain and slice into 1/4-inch-thick disks (I made them a little thicker and cut them to serve). 2. Preheat a grill over medium-high heat. Drizzle potatoes and onion slices with enough olive oil to coat. Grill potatoes for about 5 minutes per side, until the surface is browned and crisp. At the same time, grill onions for about 4 minutes per side, until lightly caramelized and soft. 3. Combine vinegar, mustard and sugar. Whisk in 1/4 cup olive oil. Season with salt and pepper. 4. Remove potatoes and onions from the grill to a cutting board and quarter (or halve). 5. Combine potatoes, onions, bacon, bleu cheese and parsley in a large mixing bowl. 6. Toss with dressing and serve warm - makes 6 servings. Note - I cooked the potatoes and onions over the direct heat while the chicken was over indirect. We used the recipe ingredients as written except we doubled it to get the one below. I changed the directions a little. 1. Place the chicken between two sheets of plastic wrap and pound to 1/2" thickness. Season with salt and pepper. Top with smoked ham and swiss. 2. Roll the chicken up lengthwise and seal up as best you can, using toothpicks to secure the edges. Make an egg wash by whisking the eggs and ice water. Roll the breast in the egg wash and then the panko. Place in a baking dish. Top each with 1 Tbsp of butter. Since my gas grill won't get to the desired 375*, I cooked them a little differently - click the above link to see Chris' original. 3. Preheat your grill and set up for indirect heat (fire/burners to the sides but not directly under the cooking area) and cook them until the breasts hit an internal temp of 150*. 4. Move them over direct medium cook to an internal temp of 155* or until lightly browned if sooner. Then flip and cook to an internal temp of 160 or until browned. Find or make a clean place on the pan or you will have burned cheese on the crust. 5. If the browning comes before 160*, move them back to indirect until it's reached. 6. Remove from heat, tent and allow to rest - they should go up to the desired 165* temp while resting. 7. When the cordon bleu gets flipped, start the sauce on the grill side burner. 9. Reduce heat to medium, whisk in the cream and parsley. Cook until the volume is reduced by half. Season to taste with salt and pepper. 10. When ready to serve, carefully remove any toothpicks from the chicken, ladle some of the sauce onto the serving plate and top with a cordon bleu. I thought the potato salad was excellent and the chicken was so good I had to call Chris and tell him so. Both were also good leftover. I now want to try the grilled potatoes with our normal mayo based salad dressing. Thanks Chris and Mary for an outstanding meal. Earlier this month, Kathy, from A Spoonful Of Thyme, posted a recipe for Chipotle-Cherry Salsa and I went to my blog recipes in search of a pork recipe to go with it, discovering Steph’s recipe for Chipotle Marinated Pork Tenderloin at Plain Chicken. I didn’t have enough tenderloin in the freezer so I a halved loin roast lengthwise so it would cook faster - faux tenderloin J.
I made the marinade as written, except for mixing, and introduced it to the meat at 2pm for a three hour soak. Add everything to a deep container, give it a spin with the stick blender to puree the chipotle, and pour over the meat - I used a two gallon plastic bag and flipped it every 45 minutes. I removed the pork from the marinade and cooked it over indirect heat to a temperature of 130* then put it over high direct heat on all four sides to develop a crust and took it to a 140* internal temperature. It rested for a few minutes before slicing. Add everything to a bowl and mix well – I made it three hours ahead of time and let it set at room temp for the flavors to marry. 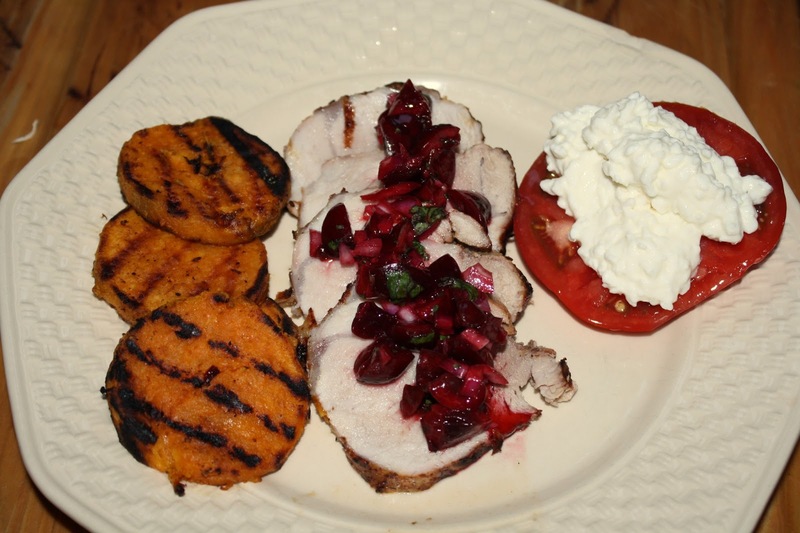 For a side dish, I par-boiled some sliced sweet potatoes, brushed them with oil, and dusted with my pork rub, which has a cherry component. I grilled them over high heat to get a little crust and brushed each side with butter after turning. Everything was delicious and I thought the marinade and salsa worked well together. Bev, who likes everything spicy, said that next time sh'e add a little jalapeno to the salsa to kick it up a notch – thanks Steph and Kathy for a very fine meal. 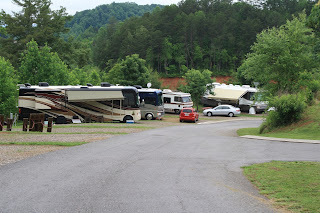 As I mentioned in an earlier post, our RV trip into Western NC was anchored around providing a place for son Eric to bunk while attending a conference at Lake Junaluska and do a little visiting with him. 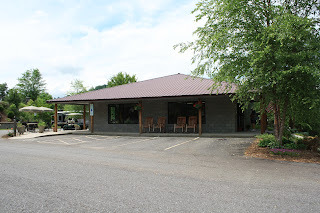 We left Franklin on Jun 9 and moved 40 miles north to the Outdoor Adventure Campground which is owned by the church and exists to provide a camping facilities for folks attending the various events that take place. 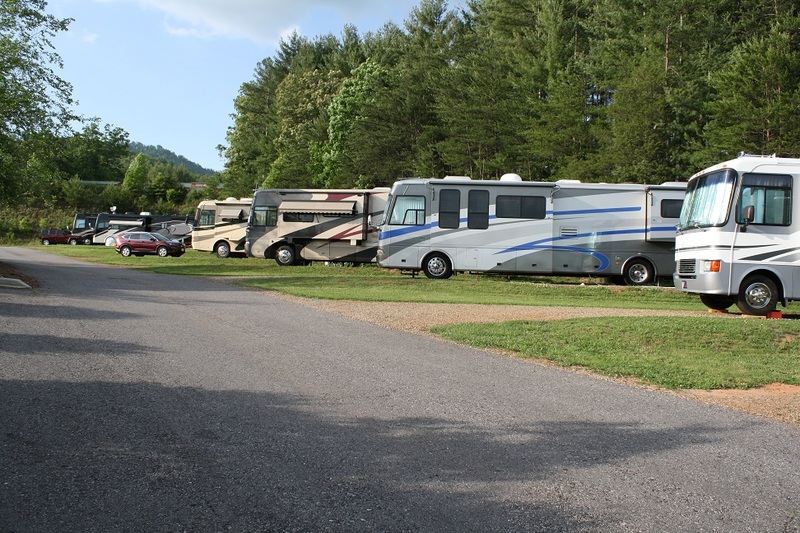 Its reason for existence is obvious in the fact that it is not very well maintained in an effort to attract drive-in campers and I would not recommend it to other RVers. 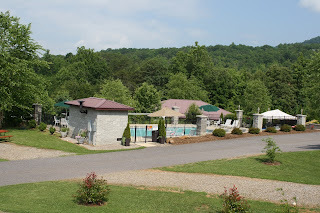 Other than visiting with Eric, the highlight of this stop was a drive over to Asheville and lunch at the Grove Park Inn - a place the SIL had been wanting to visit for a long time. It is a spectacular hotel, opening in July, 1913 as a place for the rich and famous to cool it and get well (if ailing) in the North Carolina mountains – not everyone could hang out with ole George at the Biltmore House. Ten US presidents along with many wealthy businessmen and celebrities have been guests – check the Wikipedia site for some of them. 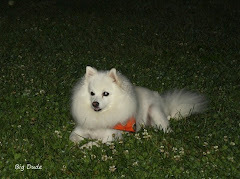 I’ve included a few of my photos, but stopping by here is a must see. My first shot is half of the outdoor Sunset Terrace Restaurant and the second shot is the view from it. The next shots are of the Great Hall which has massive working fireplaces (blurry shot) at each end, lots of seating, and a bar. I can imagine a winter visit sitting in front of the fire, watching it snow, and sipping something warm. The granite stonework in the place is incredible. These shots are of the grounds just below the restaurant (upper right) and include the top of the $44 million Subterranean Spa – through a window made the color a little off. If in the area, it is definitely worth the short drive to see this awesome place - wish I had the few hundred dollars a night to stay there. From there we headed down to the famous Farmers Market to pick up a few things for supper. 1. Heat chicken broth to a simmer and soak peppercorns in hot chicken broth for an hour while the chicken cooks. 2. Rub chickens with oil, install on the spit, and sprinkle with S&P. Add spit to grill using inferred back burner and set a pan on the grill grate to catch the juices. Cook to a temperature of 160* in the breast and 175* in the thigh, remove from the grill and rest while making the sauce. 5. Add some chicken stock and deglaze the pan. 6. Add the peppercorns, remaining stock with peppercorns, heavy cream, rosemary, and simmer to reduce by half. 7. Remove chickens from the spit, split into half chicken servings and side with cheese grits Ala David Klett both topped with the sauce. My shot isn’t too great as I put the chicken skin side down to get the sauce right in the breast meat and have it stay – presentation wasn’t too important this day and I considered not posting it but this blog is my recipe file. It was very good and I loved the sauce on both the chicken and the grits and will definitely make it again - I have an 8 oz. jar of the peppercorns to use up J Thanks Ann for a delicious meal. During the 2013 Blogger Party, we arranged to meet up with Sandy and Stu Hoffer for lunch and a visit to Highlands, NC. They live about an hour away on the western side of the Smoky Mountains. We met for lunch at the Caffe REL, which shares a building with the Hot Spot gas station on East Main Street in Franklin. While a unique location for a Bistro, to say the least, it received 4½ stars everywhere I looked - check out Sam’s post (My Carolina Kitchen) from November, 2009 for more details. According to the chef/owner, he spent most of his career working for corporations including the prestigious Greenbrier in White Sulphur Springs, WV and finally decided it was time to quit making them rich and make a little for himself – based on his white 911 Porche Carrera, it’s working. 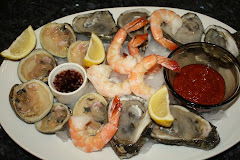 Bev and I each had oysters with hers being fried and on a po' boy and mine being poached and served over linguine with a spinach sauce. Both of our meals were delicious and I will definitely go there again if in the area and would encourage you to do the same – thanks Sam for the recommendation. Highlands seems to be a typical tourist town for the area and Stu and I found a nice wine garden at the Old Edwards Inn & Spa and drank a cold Highlands Brewing Company ale while the women did their shopping thing - the tall lady in the white pants was modeling for the boutique next door. The road from Franklin to Highlands is a curvy narrow road that runs through the Cullasaja River Gorge and provided a shot of this side stream waterfall that could be driven under and the impressive falls on the main river after a big rain. It was a very pleasant way to spend an afternoon and Stu and Sandy are so nice to be around. Photos best if enlarged by clicking on them - especially the falls. The first stop on our recent RV trip was Franklin, NC, which bills itself as the Gem Capital Of The World and based upon the number of mines, it would be a hard brag to refute – nine mines in a small area. When I think mine, I think of a hole back in a mountain into which one goes in search of riches, but these are really miniature strip mines where you dig in the gem laden dirt or someone else digs it for you. You can also buy seeded buckets where gem stones have been added to the dirt for you to find. 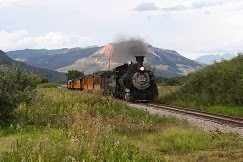 After talking with several work-campers at the campground, we went a couple of miles to the Mason Mountain Mine. This place is somewhat unique in that the actual mine is up on the mountain where the gemstone laden soil is loaded into a dump truck and dumped at the base of the mountain. 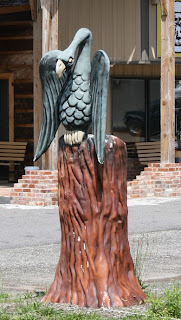 We passed this guy (wood carving) on the way. At the mine, for $20, we were given a five gallon bucket, a screen bottomed tray, a trowel, use of a dolly, and four hours to wash as much gravel as we could ($30 for all day). This is the entrance and as you can see it’s nothing fancy - also a shot up the flume. After filling our buckets from the pile and using a dolly to move them to the flume, we troweled the dirt into a screen bottomed tray and washed away all of the dirt until only rocks were remaining. Since we were rank amateurs, it took us a long time to go through the first bucket, but with some instruction, Madison quickly figured what we were looking for and our process picked up rapidly. We were picking out little pieces of garnet that were useless, until we realized it was the larger and cutable rubys and sapphires that we wanted and they basically looked like smooth rocks with a pink or blue cast to them. After the owner dumped a fresh load of dirt and we knew what we were looking for, we ended up getting several cutable stones in a short period of time. The big ruby in the first shot (lower right) was uncutable, but the large sapphire near the glasses (second shot) yielded a good sized gem. After finishing I asked Bev if she looked forward to the next time or if she’d been-there-done-that and she picked the latter. Again, after talking with the campground guys, we took our stones to the Jackson Hole Gem Mine for cutting. They charge $45 per finished karat for the cutting, which sounds like a lot, but they sell their finished stones for $120/carat. We just took our bag of rocks and the young lady quickly separated them into cutables, too-small-to-fool-withs, and rocks. This is our completed haul with a total weight of 68 carats - the largest sapphire is 10 carats and the largest ruby is 6 carats. The other three are star rubies and supposed to be quite valuable. The smaller stones are about a carat. I gave up on trying to get a good shot of them. After seeing the finished gems and writing a pretty big check, Bev, Pat, and Madison accepted the two free $50 buckets of dirt they offered, found a bunch more stones, and took a few of them back in to be cut. I then understood the game: the mining is just a way to provide rocks for their real money maker – gem cutting and setting. I’m confident that if they knew you would have them cut, they would just give you the gem stones. With eight grand kids (seven girls), we can envision a nice piece of jewelry for each and Bev has changed her tune to maybe we should do it again sometime. 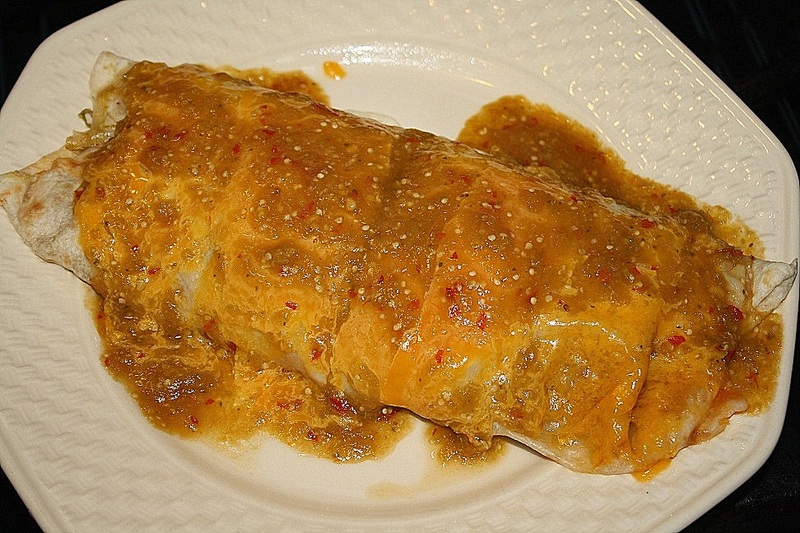 A couple of weeks ago I first posted about the enchiladas and sauces made for us by Maria, which we requested after first trying her burritos - I failed to post about them but did not want to miss round two. After trying all of the meats she uses the first time, we ordered eight of them, all made with chorizo, and began by topping them with some of Maria’s Salsa Verde and went I saw it on the plate, I decided to split it with Bev. Sorry about the photos. After warming, Bev topped it with her usual toppings of cheese, lettuce, and tomato plus some avocado. Look quick the shot is blurry and I don't know why I just took one - hunger perhaps. As expected, it was again delicious. A HEADS UP - When I began this blog, it was intended to contain an eclectic collection of topics, but it has morphed into mostly food – I guess because we cook nearly every day so it’s easy to blog about. Now that we plan to travel more, please expect more posts related to it and maybe some other things as well but I hope to still have lots of food, so I sure hope you foodies will keep stopping by. 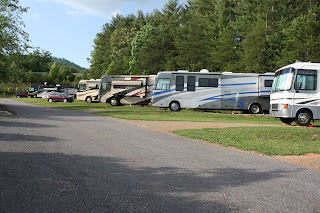 After our maiden five night RV trip to Sevierville, Tn about 60 miles from home, we headed off to the mountains of southwestern NC for 10 nights. This trip was anchored around being at Lake Junaluska so son Eric could have a place to bunk during the Annual Meeting of the United Methodist Holsten Conference (separate post coming). 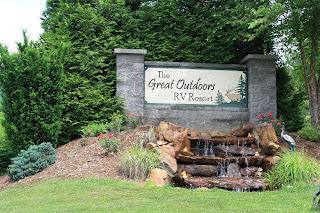 Since we wanted to make a longer trip, we decided to spend six nights at the remodeled “TheGreat Outdoors RV Resort” a few miles north of Franklin – Bev has wanted to come over for gem mining for several years - more later. This is the entrance and registration/store/gift shop. The resort is under new ownership by a businessman who seems committed to making it a first class place – he even stopped by our site the first night to welcome us and offer some beer from the Heinzelmännchen Brewery in Sylva. Unfortunately I had a glass of wine going, but committed to myself to pay them a visit - this was our site and a shot up and down the hill from us - note Bev wrangling the dogs. The grounds were well maintained and there are several on-site work-campers who do everything from registration to shrub pruning and trash pick-up. 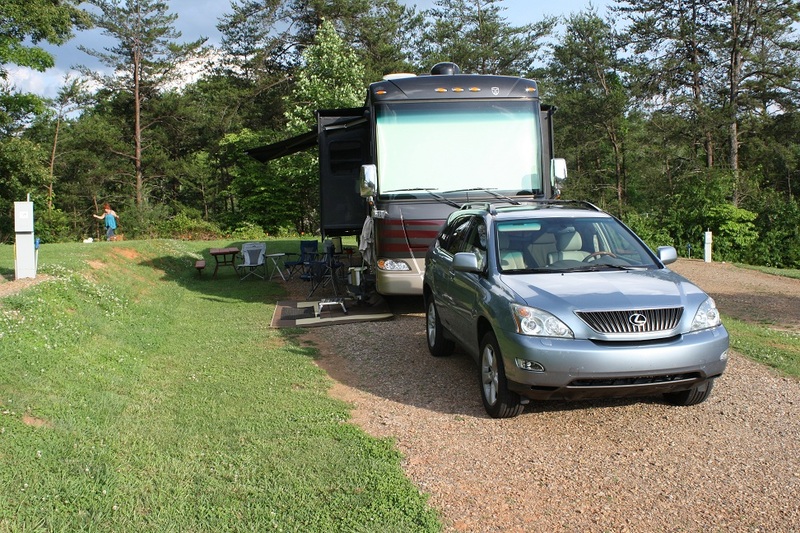 This is a great way for full time RVers to afford living on the road and I might consider it if I didn’t get more than I wanted of this type work at home. This is the well groomed heated pool area. 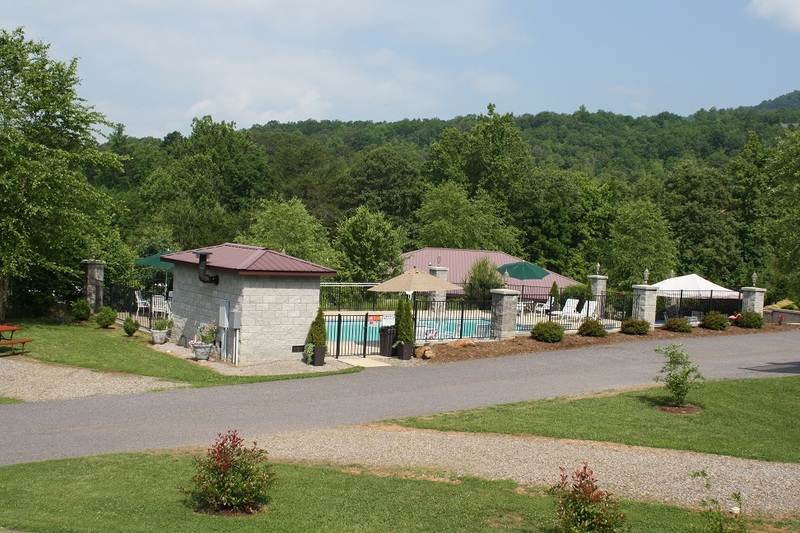 While it varies at different places depending upon site rates, at this resort, they work 40 or so hours/month in trade for their camping site with a minimum two months commitment. One fellow we talked with was planning to leave here in September and work his way south to the Mobile, AL area for the winter - sounded like a pretty good life to me. 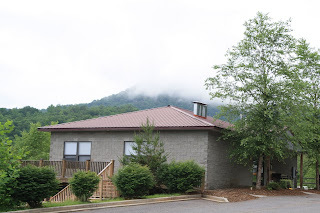 We had rain many nights while there and it was often foggy in the morning - this is the smoke coming off of the Smokies above the clubhouse/shower rooms - taken while sitting at our site. 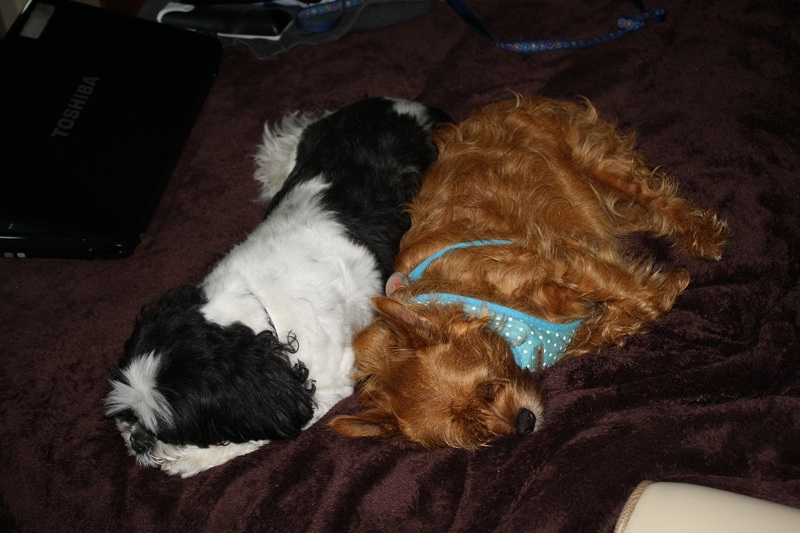 I dog-watched one day while the girls went shopping and as you can see it was a pretty rough job. 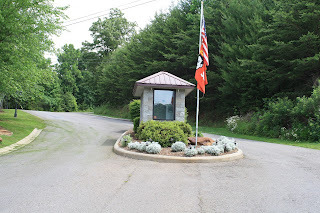 We found this to be a great place to stay with good sites, everything worked, and the staff was very friendly and helpful - I picked up lots of tips from the work campers as many were full time RVers. 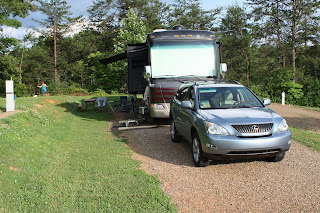 If in the Franklin area again, I will definitely stay here and would recommend it to any RVer. 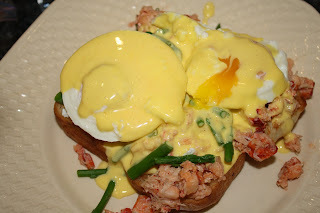 Our friends Laurie & David (Big Daddy Dave) came over for a meal of homemade ravioli which ended up being a flop, but I still had lots of the lobster stuffing left over and Dave suggested making lobster benedict from it. According to Wikipedia, “Eggs Benedict is an American dish that consists of two halves of an English muffin, topped with ham or bacon, poached eggs, and Hollandaise sauce.” The same site lists 20 variations, each with its own name, such as Eggs Florentine, but none of them used the ingredients in my dish. I got a big kick out of the liberties taken with this one – Country Benedict replaces the English muffin, ham and hollandaise sauce with an American biscuit, sausage patties, and country gravy. The poached eggs are replaced with eggs fried to choice. Since none of the named variations matched up with my ingredients, I decided to call it Almost Heaven Lobster Eggs. 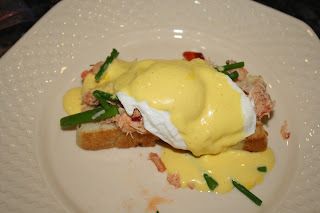 My first deviation from Eggs Benedict was the bread as Bev suggested we use the leftover homemade rolls from the ravioli dinner and the second was the use of lobster as the meat. Since we had fresh-from-the-garden asparagus, I decided to add it similar to Oscar Benedict, which replaces the ham with asparagus and lump crab meat. I used cups to cook my eggs so they were steamed rather than poached but we did use Hollandaise Sauce - Bev had her egg poached.